After toiling for years and bouncing from league to league, Nexen Heroes starting pitcher Jake Brigham seems to have finally found his stride. 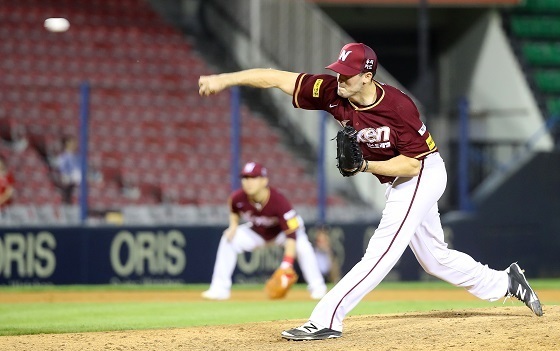 Brigham has been stellar for Nexen in the second half of the Korean Baseball Organization season, and was recently named player of the week for the final week of July. The 29-year-old Brigham began his professional baseball journey in 2006, when he was drafted out of high school in the 6th round by the Texas Rangers. He then spent 9 years in the minor leagues, bouncing between different levels and different organizations. He finally got his major league shot in 2015, making his debut for the Atlanta Braves, but could not seize his opportunity. He pitched in 12 games, throwing 16 2/3 innings with an ugly 8.64 ERA. Last season he took his shot in Asia, joining the Rakuten Golden Eagles of Japan’s Nippon Professional League. He appeared in 11 games, throwing 34 1/3 innings with a 5.24 ERA. Following his stint in Japan, he was out of a job until May of this year, when Nexen brought him to Korea to replace struggling starter Sean O’Sullivan. Brigham was respectable but inconsistent for Nexen in the first half, starting 10 games and going 4-3 with a 4.52 ERA. He had some stellar patches, including allowing only four runs over 28 innings pitched in four starts in early June, but also some struggles, including getting touched for seven runs in just 4 2/3 innings in a start against Hanhwa on June 22. Following the All-Star break, Brigham is on another hot streak. He has won all three of his second half starts, throwing 20 2/3 innings and allowing only four runs, good for a 1.32 ERA. But this streak is different. Brigham is allowing many fewer baserunners than at the beginning of the season, thanks in part to a sharp decrease in walks. After walking 2.04 batters per nine innings pitched in the first half of the season, Brigham has so far only walked one batter in the second half for a measly 0.44 BB/9. Brigham’s other peripherals are improved too. His strikeouts per nine innings has increased from 4.96 to 7.40. He has also decreased his hits allowed per nine innings from 11.09 to 7.84. For the first time in his professional career, Brigham is pitching consistently, and pitching well. And his emergence could not have come at a better time for Nexen, who are currently holding a tenuous grip on the final playoff spot in the KBO standings.